It’s been a long cold winter, but finally spring appears to be on the horizon! We purchased some fruit trees to add to our collection 2 weeks ago. We have an apple tree, a ‘herefordshire russet’ on an M9 root stock, apparently this should only grown to about 2.5m tall, we bought this at our local garden centre, it appear to be 2-3 years old, but was on offer at £10! We have popped it in a nice sized pot with the intention of trying to train it. We were originally looking at trying to espalier it, but that would require some very drastic pruning, so I think we may be a little more restrained and just try to maintain a nice shape as a smaller standard tree. 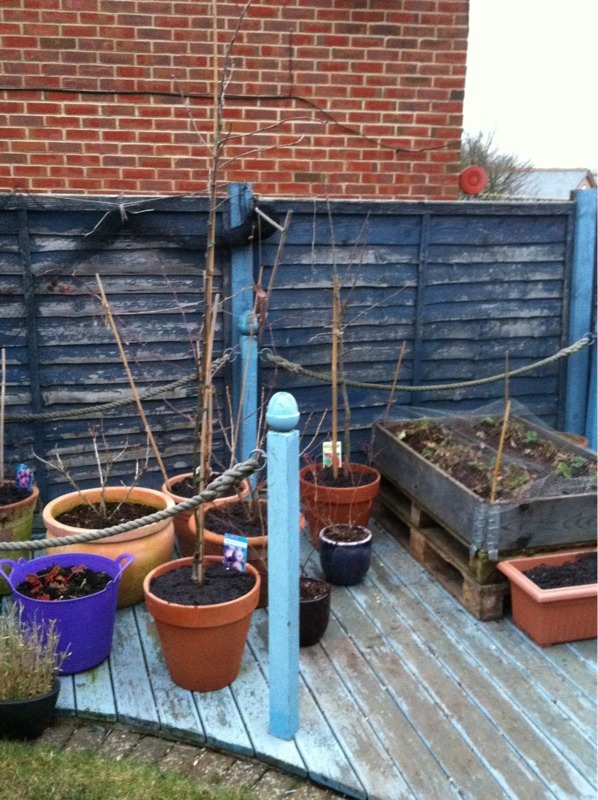 Another addition to the family was a plum tree, for this we went for a ‘victoria’ as we love the flavour. This came from another local garden centre, which is also an orchard, it was bare root but appeared to be healthy looking, a bargain at £15! This is again in a pot, as it should be easy to train and is only 1.5m high at the minute, we have some time to decide what shape to make it. We took the opportunity to add another raspberry cane to our collection, as last years canes didn’t seem to send up many runners to be this years canes, it is a different variety, but this should just mean that we have fruit over a slightly longer period. In addition to these we picked up two blueberry bushes, both about 18months old and a bare root redcurrant bush. These are all in pots and have already started to break bud! The remainder of our fruit is now playing catchup, the loganberry, blackcurrant, gooseberry and kiwi are all racing to put buds out and open them up ready for when the bees arrive to start pollinating. We discovered whilst researching apples that as apples are not self fertile you need at least one apple tree from a compatible group to pollinate your tree, however it turns out that crab apple can also pollinate a standard apple tree, this is quite helpful in an urban environment as crab apple trees are often planted in an ornamental capacity. The lemon tree seems to like it’s new house, the warmth overnight seems to be helping it to hang on to it’s fruit, maybe we might even get to eat some this year…. The onions and garlic that we planted at the back end of last year are looking good, we had to take the seed sown onions out to plant the broad beans, but will be trying those again next year under a cloche to give then a head start. The rhubarb appears to be much happier this year, hopefully having not taken many stems from it last year will have boosted the crown. Well we have just finished the last of our home grown potato’s. We uses the last onions about 2 weeks before Christmas and have 1 meals worth of carrots left in ground to harvest. So if we were being self sufficient then we would be looking to a very hungry few months ahead ! It has given us a good idea of how much we need to plant to see us through. We basically had 6 months worth of onions, carrots and potato. Although with the potato’s we mainly had smaller potato’s in our crop, so purchased larger ones for jacket potato’s from the supermarket. should be better able to start these crops off in modules before planting out in the cold! So our greenhouse arrived a couple of weeks ago, it was a pig to build, mainly because the instructions appear to be written to make the process as confusing as possible. The basic system appears to be that you build the two gables completely, then try and stand them both up and attach the two sides. We got our greenhouse build just in time judging by the weather, we have had 2 weeks of very cold weather with snow and ice, along with daytime temperatures of below zero degrees celcius ! Having moved our Lemon tree into the greenhouse to keep it cozy over the winter months we have invested in a new heater. We have opted for the Parasene Super Warm 4 parrafin heater. This is suitable for a greenhouse upto 6′ x 6′ footprint. Ours is 6’3″ x 4’3″ so it should be ideally suited. It has a stated burntime of 168 hours on a full tank (4.5L) and so far that seems to be about spot on. We have it set to a midrange setting which keeps the temperature above zero even when the outside temperature is down to minus 7 degrees. Quite impressed so far, lets hope it keeps up the good work. We have lined the inside of the greenhouse with a layer of bubblewrap to help insulate against the cold, and as we have the greenhouse sat ontop of our decking, we have put a false wooden floor inside to reduce any draughts coming up from below. The indoor salad crop doesnt seem to be getting enough daylight at the minute and is wilting, so we have picked a few of the larger leaves and thrown the rest away. We will have to work on an alternative plan for winter salads. 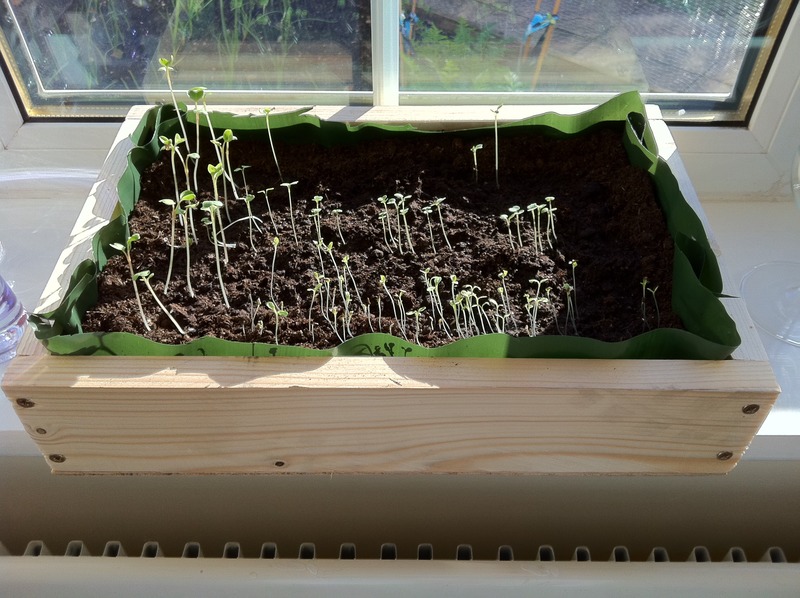 The kale that we had growing in our outside salad bed was just starting to grow its 4th set of leaves (the plants were about 2-3 inches tall), when the snow hit and stunted the growth. We picked the remaining lettuce and kale leaves and had then for our dinner the other evening along with jacket potato’s and roast beef. We have started planning our next years crops and how many we will plant. We have decided to forgo brassica’s for 2011, and plant some extra potato’s. We are also planning on trying a new ‘autumn/winter’ carrot variety as the ‘autumn king’ that we have grown are okay cooked, but a little flavourless when eaten raw. 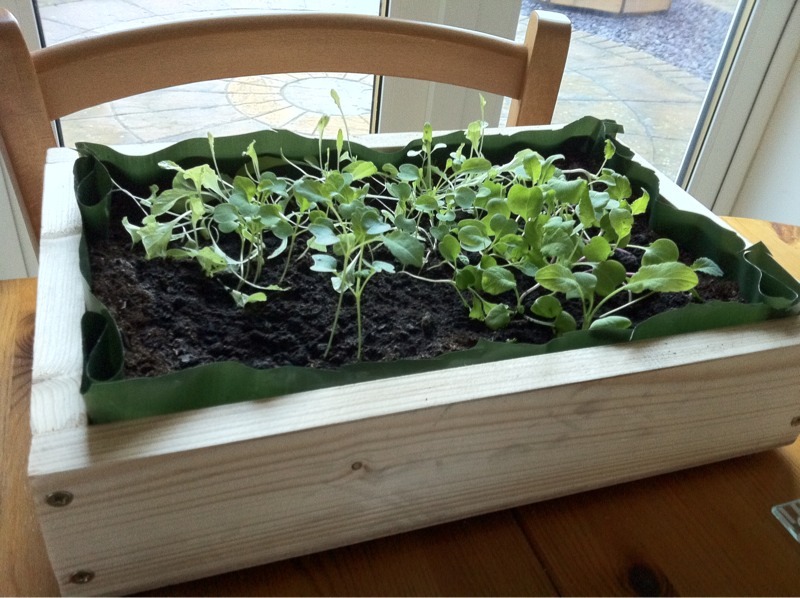 So it’s been a few weeks now since we first planted our salad crops in our indoor salad bed. The seeds we planted were kale, continental salad selection and radish. They have all germinated and have shot up, however they are looking a little leggy at the minute. On a much more positive note we started some brown button mushrooms off that I gave Helen for her birthday. It is a kit from ‘Taylors bulbs’, we tries growing mushrooms from a pack of spores oats earlier in the year, buy they weren’t at all successful, so we were really pleased to be able to harvest our first mushrooms last weekend, which we ate with our cooked breakfast. They were very tasty, and we have a good few more popping up already. So this would seem to be the best option for us as far as mushrooms go. Wow, today is the first anniversary of our move into this house. What a productive year it’s been. We are still eating our own potatoes, onions and garlic that we have already harvested. We still have carrots in the ground fattening up nicely, along with next years garlic and onions. Bizarrely our strawberry plants are bursting with fruit again, which is turning a nice colour, albeit a bit slower than in summer. We ordered a greenhouse 3 weeks ago for our lemon tree, as our makeshift home for it is already too small, and not really insulated enough to are the lemon through the winter. Our indoor salad crops are looking good, as are our outdoor salad crops, much to our surprise. We have strews planning our new years produce already, which has meant a few changes to our planters. I will reveal more about that later on. So hope you have had a successful twelve months, looking forwards to seeing what the next year has in store for us. So this weekend we added a new member to the garden family. As we have a lot of productive space in the garden devoted to vegetables and fruit, we decided that it was time to add a section of ‘pretty’ plants. So we decided to build a new raised bed to sit along the fence that is predominantly in the shade. 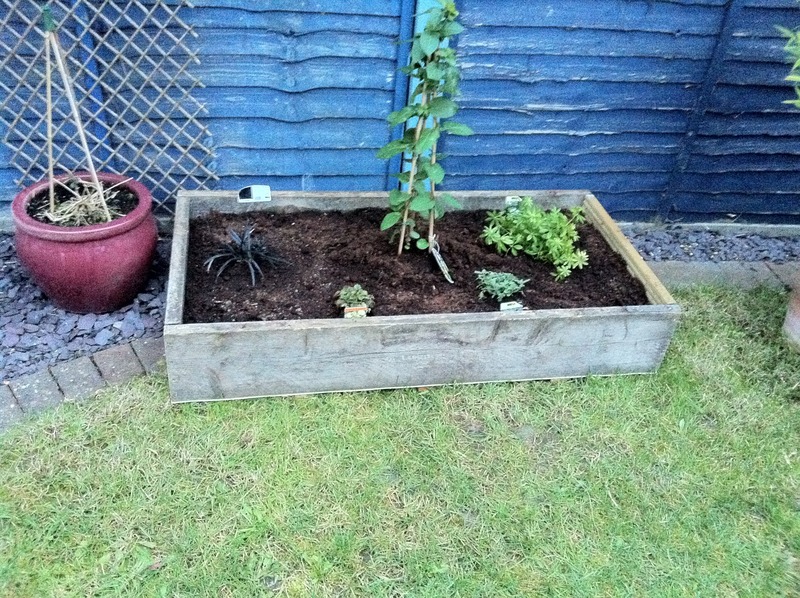 We had a few bits of scaffold board left over from the main raised bed that we built in the front garden. This gave us enough timber to do 3 sides of the bed raised border, for the fourth side we cut down some left over decking boards. In it we have a honeysuckle in the middle, at one end we have a woodruff (the token productive plant), at the other end is a dark grass. Hopefully these plants will spread nicely, we have some tulip bulbs randomly popped in the ground around these plants to give a bit of spring colour. So the weather has started to turn for the worse now. We had our first frost last week. 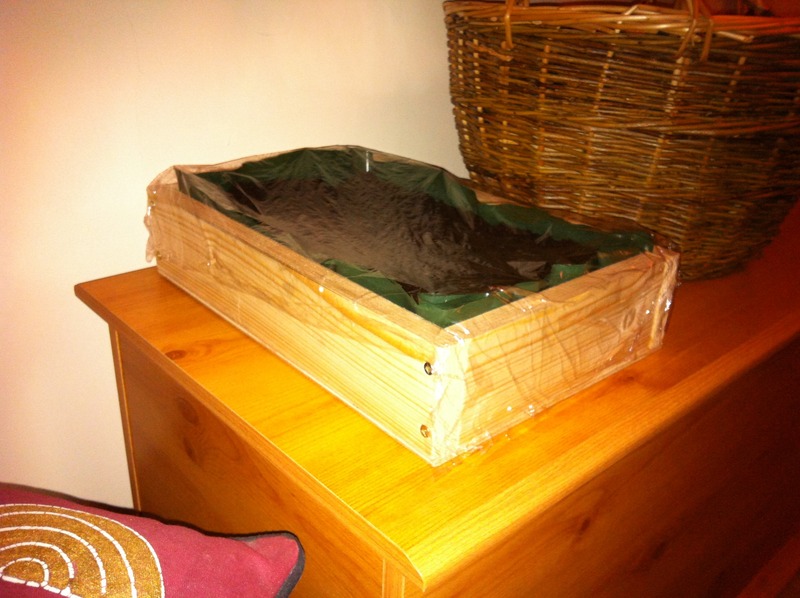 I suspect that the salad crops in our garden will possibly not be a rip roaring success, so in preparation we have built an indoor bed out of some 50mm x 19mm timber with a plywood base. The wood is offcuts from a previous project. To protect the timber from going mouldy we have lined it with a piece of thick plastic bag. In it we have planted some radish, continental salad collection, kale and rocket. We didn’t plant masses of any of these plants, but just enough to keep us going. In the space of a week the seedlings have germinated and shot up to over an inch tall!